There’s this patch of forest not terribly far from where we spent last night, where we can stay with only the sounds of frogs (and perhaps the odd generator and grinder if we don’t choose our travelling companions carefully) to keep us company through the night. It’s only a few kilometres really or in the interests of precision, fifteen, between last night’s spot and there but, and it’s a large but, between us and there lies the lock at Rechicourt. That would be the big one with the fifteen metre rise which is the largest on the canal system. It’s not the lock that is the problem, as things go it is quite innocuous, but it is fair to say our boat and it have not enjoyed the smoothest of relationships. 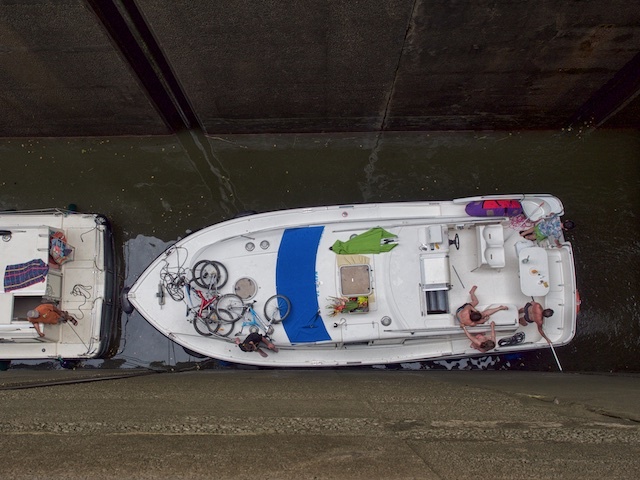 At one point we had broken down in its vicinity so often that one of the lock-keepers suggested that we tie a rope to the boat ahead in case we needed to be towed out of the thing. To believe that the lock is the source of our troubles would be to stretch our non-superstitious brains a little too far, but could it possibly be coincidence that having resolved all our mechanical ills, we timed our arrival to coincide exactly with the confluence of mid-summer rental traffic and the need to provide a restricted service to conserve water. We did arrive in our shady spot, some seven hours after setting out, where we met a cyclist from the Czech Republic who had travelled ten times that distance in the same time, but our faces weren’t flushed, nor were our bodies a lather of sweat in a state of near dehydration.